Until recently, if you wanted to search your image library for a specific photo, you had to scan your library manually, remember the date you took the photo, or spend a lot of time up front tagging your photos with relevant keywords and titles. But thanks to iPhoto ’09 , you can now also search by where you were when you snapped the shutter. The Places feature takes advantage of geodata—longitude and latitude coordinates embedded in a photo’s metadata. Once iPhoto knows where your photos originated, you can use the information to quickly track down shots from a specific locale or show off your travels to friends. 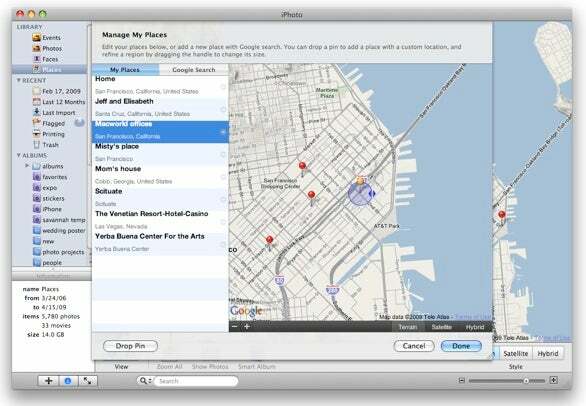 If you’ve been geotagging your images using GPS hardware or an iPhone, iPhoto ’09 reads that data automatically. But for folks who haven’t invested in geotagging hardware, the true beauty of Places is that it lets you quickly add location data to pictures already in your iPhoto library. To add geodata to a single photo, position your mouse over the image’s thumbnail and then click on the i icon that appears in the lower right corner. This opens the Photo Info pane. Click inside the Enter Photo Location field and type the city, state, or country where the image was captured. iPhoto will offer at least one location in the list below the search field, and display a Google map with a yellow pin for your location. If the pin is in the appropriate spot, click on the Done button. If the pin isn’t in the right place, you can refine its position. Return to the Enter Photo Location field (you may need to delete your original search) and choose Find On Map from the popup menu. iPhoto opens the Edit My Places dialog box and puts your cursor in the Google search field. From here you can enter a specific address or use additional search terms. Select the appropriate search result to see its location on the map. You can now drag the yellow pin to a more precise location—for example, to mark exactly where you were sitting in the park. For a closer look at the mapped area, click on the plus-sign button to zoom in (or use the scroll wheel on your mouse). Sometimes it’s helpful to switch to the Satellite or Hybrid view to see the buildings and landscape for accurate pin placement. 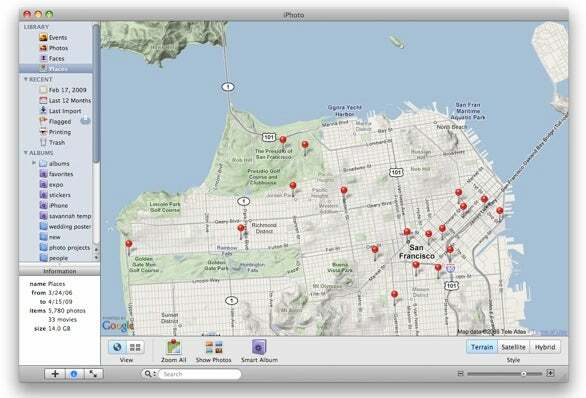 Start typing the name of a city in the Photo Info pane, and iPhoto will suggest potential matches and mark them on the map. When you have the blue pin where you want it, you might want to refine the name you use for the location in the list—for example, you could label your home address as “Home” or add the name of a specific building on your college campus. Just click on its name and type your description, then hit the tab key to enter it. Doing this for places you frequent will save you time later as you’ll be able to locate them by searching for your custom label, rather than typing in an address. If you want your pin to encompass a larger area, such as an entire park, you can enlarge the shaded circle area around the pin by grabbing its handle and dragging outward. When you’re done, click on the Assign To Photo button. You’ll get the most out of iPhoto’s Places feature if you assign location data to your entire library. That may seem like a daunting task, but there are some ways to save time. Work in batches: You’re not limited to tagging one photo at a time. To add a location to multiple images at once, shift- or Command-click on the photos you want before clicking on the i icon on any selected thumbnail. You can even tag an entire event in one go—or multiple events, to really speed things up. Simply click once on the Events icon in the Library pane (or shift-click to select multiple events) and then mouse over an event’s thumbnail to reveal the i icon. When you’re done, iPhoto adds the location data to all of the included images. One warning: if you merge an event you’ve batch-tagged with another, your photos may lose all of their geotags. In that case, you’re better off tagging the photos individually. Create locations in advance: If you know ahead of time that you’ll be tagging pictures at specific locations—for example, at relatives’ homes—you can create geo-bookmarks for them in the Edit My Places dialog. Go to Window -> Manage My Places, click on Google Search, and enter a location in the search box. After you select the one you want from the results list, click on the plus-sign button in the location label to add it to the My Places list. Want to mark several places in the same area? To quickly add another location nearby, click on the Drop Pin button. This creates a new yellow pin that you can move around, then you can add it to My Places. If you later decide to delete a location, you can remove it from the list in Edit My Places by clicking on the minus icon in the label field. 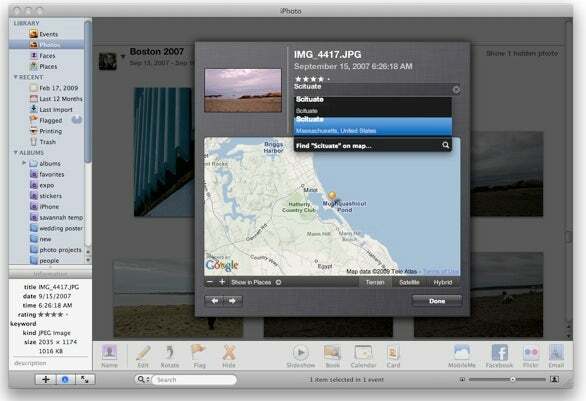 iPhoto will warn you if you have photos geotagged with that location. You can create easy-to-remember names for your favorite places. The My Places list lets you manage these custom locations and create new ones. Use the arrows If you find yourself opening and closing the Photo Info box as you move from picture to picture, you’ll be happy to know that you don’t have to leave it to tag the next image or event. Just use the left- and right-arrow keys to navigate through your photos. You’ll find that you can work on a series of pictures much more quickly this way. When you specify a location using the Photo Info window, iPhoto adds latitude and longitude coordinates to the GPS section of the image’s metadata. This is typically an area that users don’t have access to. iPhoto also adds descriptive location labels that include the country, state, and city. You can see these coordinates yourself by clicking once on a tagged picture in iPhoto, then pressing Command-option-I to reveal the Extended Photo Info panel. 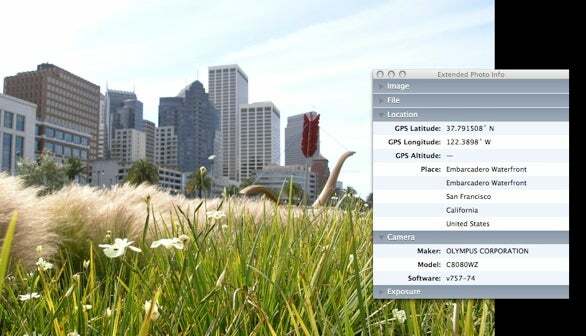 Once you've mapped a photo, the GPS data and location name appear in the file's metadata. Because this valuable information is now safely nestled in the GPS metadata, it can travel with the image, even when you export it out of the application. To keep the coordinates intact when you export images from iPhoto ’09, be sure to check the Include Location Information box in the Export dialog (File -> Export). You must also give approval for images that you publish directly to the Web by going to Preferences -> Web and turning on the Include Location Information For Published Photos option. If you use Flickr’s online photosharing service, you can take advantage of iPhoto’s built-in Flickr uploader to send geotagged images to your photo stream (the site offers a Map feature for viewing tagged images). Just keep a few additional things in mind: first, make sure you’re using the latest version of iPhoto (currently 8.0.2). You’ll also need to open your Flickr account’s Privacy & Permissions section and set the Import EXIF Location Data option to Yes. Of course, there may be times when you don’t want this data to travel with your pictures. For example, you may not want the world to know where you live when you publish photos of your son’s birthday party. So remember, you’re in control. To make sure you never accidentally publish geodata with your images, consider leaving the options for including location data unchecked by default. You can reap the benefits of your geotagging efforts in many ways. Start by clicking on Places in the Library pane, and then click on the map view icon (it looks like a globe) in the lower left corner. Next to it is the Zoom All button that adjusts the map to show pins for all the images you’ve tagged in your library. This provides an overview of where you’ve taken your pictures. Mouse over any of the pins, and a label appears describing that area. You can zoom in on an area by double-clicking on it on the map (control-double click to zoom out), using your mouse’s scroll wheel, or by adjusting the zoom slider in the lower right corner of the window. To see the photos associated with a specific pin, select the pin and then click on the right arrow next to the pin’s label. All images tagged with that locale appear as thumbnails in the browser window. If you want to broaden your field, click on the Show Photos button instead. iPhoto will display thumbnails of all images taken within the area you have displayed on the map, even if they are associated with different pins. Select a single pin to see the photos tag from that location. The Smart Album button will place the photos from all currently visible pins in a smart album. If you find the map difficult to work with, try switching to Places’ list view (the grid icon). Four columns appear at the top of the browser: country, state, city, and specific location. If you click on any of the labels in the list, iPhoto displays the images that are in that location. I think this is the fastest way to find images in a specific place. After you’ve added geodata to your images, you can use smart albums to pull photos together from this data. There are two ways to do this. Current view: First, in any map view, you can click on Smart Album at the bottom of the interface. iPhoto will create a smart album with all of the photos from the visible locations. This is useful for gathering photos of your neighborhood, for example. Custom albums: You can also manually create a smart album (File -> New Smart Album) that takes advantage of the new “Place” search condition. Select File -> New Smart Album, choose Place from the far left popup menu, and then type a country, state, or city in the text field on the right. Click on OK, and iPhoto will search the location data of each photo in your library and round up the appropriate images. So, for example, if you return home a few times a year to visit your family, you could use this feature to build a location-based album that contains all of the photos you took during your visits. And the best part is, the smart album will be automatically updated as you tag images in the future. Now that’s a sweet place to be.